It’s hard to deny that Guardians of the Galaxy, Marvel Studios’s latest comic book-to-screen epic, is lots of fun to watch. It’s full of snark and bombast, packaged in a visual effects spectacle that easily stands at the top of the Marvel franchise of films in terms of FX accomplishment. Its central characters, while not always fully realized, are engaging in the ragtag, loveable losers sort of way, and their interactions with one another are as much a part of the movie’s appeal as all those nifty spaceships, colorful explosions, and fanboy-friendly easter eggs hinting at Marvel movies to come. But it also suffers from the requisite clunkiness that comes when a film has to introduce so many characters and set lots of moving parts in motion in the early going, and wraps up with a less-than-healthy helping of cheesiness in its final act that might set more cynical viewers’ teeth on edge. Does all that spoil the movie as a whole? Not at all. But it does keep Guardians of the Galaxy out of the “Best of Marvel movies” discussion, and leaves lots of room for improvement in the already-promised sequel. But who are the titular “Guardians of the Galaxy”? Peter Quill (Chris Pratt), a human abducted from Earth as a child and who’s grown up in space in the company of a mercenary group called the Ravagers, finds himself the object of pursuit by a lot of people when he takes possession of a mysterious metal orb buried on an abandoned planet. 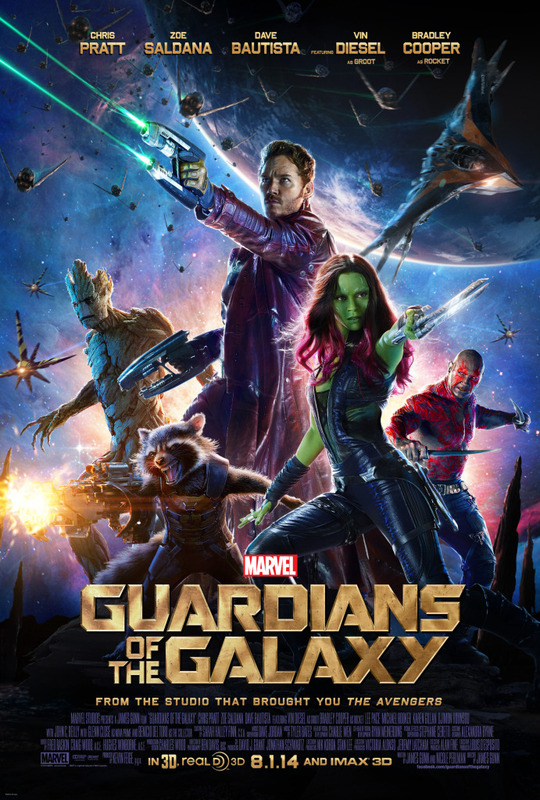 Among those chasing him are Gamora (Zoe Saldana), a green-skinned warrior and assassin; Rocket and Groot (voiced by Bradley Cooper and Vin Diesel, respectively), a pair of bounty hunter thugs out to collect on Peter’s outstanding warrants; Yondu (Michael Rooker), the leader of the Ravagers and the guy Peter was supposed to turn the orb over to in the first place; and scariest of all, Ronan the Accuser (Lee Pace), a fanatic xenophobe member of the Kree race of aliens. Ronan wants to trade the orb to a certain even-scarier bad guy (here’s a hint, true believers: we saw his face in profile at the end of Marvel’s The Avengers) in exchange for the power to destroy the planet Xandar, home of the peacekeeping Nova Corps that until recently had been at war for decades with the Kree, and he has lots of minions to help him get the job done. Peter, who calls himself “Star-Lord” by the way, gets himself thrown into a Xandarian prison along with Gamora, Rocket, and Groot when they’re all caught fighting over the orb in Xandar’s streets. Once there, they meet up with Drax (Dave Bautista), a grey-skinned, tattooed mountain of a warrior bent on killing Ronan for past wrongs, and the quintet agree to put aside their differences in order to escape and get the orb safely away from Ronan and anyone else who might abuse the power it contains. So in other words, an wise-cracking outlaw, a living weapon, a practically-mute humanoid tree, a genetically-engineered talking raccoon with anger management issues and a predilection for big guns, and a muscle-bound, tatted-up killer with a vendetta set out to save the galaxy from a genocidal warlord. Be honest, now: how does that not sound like a good time at the movies? From the moment Marvel Studios president Kevin Feige announced that a “Guardians of the Galaxy” film was in the works to be a part of the greater Marvel Cinematic Universe, the most-asked question has been how would they get regular non-fanboy or fangirl folks to buy into a relatively obscure, if not wholly unknown comic book brand and motivate them to go out to theaters and see that brand on the big screen. 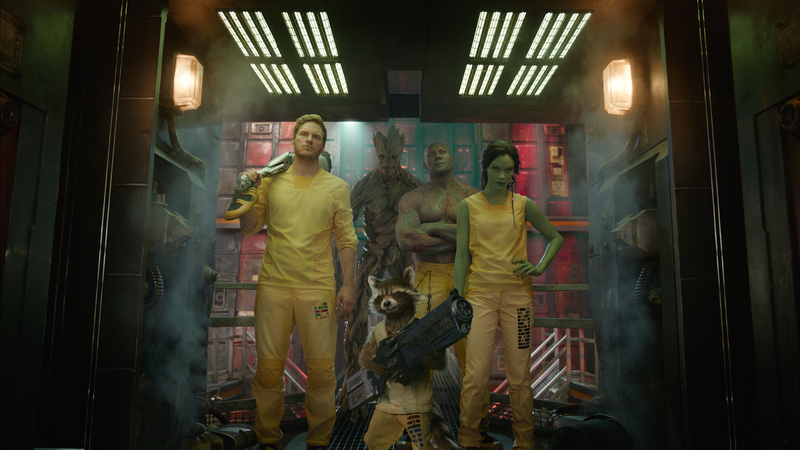 Their answer to that challenge, in addition to a massive marketing effort heavy on exposition to familiarize the public with the film’s main characters, is writer/director James Gunn, whose approach to the material seems to be this: win the crowd over with the misfit humor and the soundtrack and they’ll forgive everything else. It may sound like an oversimplification, but look beyond the space battles and explosions and you’ll see that’s what at the heart of the film, and it almost works. Between the banter and bickering exchanged between characters and the music infused with pop hits of the 70’s and early 80’s (don’t worry–it actually serves a purpose in the story), and you just might more inclined to overlook the clumsy scene transitions, the lack of nuance in the way certain characters are written, and just how much the plot borrows from long-established sci-fi franchises like Star Wars and Star Trek. Speaking of the characters, some clearly get more love than others from Gunn and fellow screenwriter Nicole Perlman’s script. Chris Pratt gets lots of opportunities to play up both earnestness and goofiness with Peter, while Bradley Cooper with his voice alone practically steals every scene as the abrasive, trigger-happy Rocket. Vin Diesel’s voice work consists of no more than four choice words, but those four words said in key moments actually get funnier each time they’re uttered, which is a tremendous credit to Gunn and Perlman’s sense of comic timing. But perhaps the biggest surprise performance in the film is that of former wrestler Dave Bautista. Sure, he’s not asked to say much, and the lines he’s called upon to deliver he delivers stiffly, but that’s written into his character, and thus it plays to his relative inexperience. If anything, he brings gravity to his role, moreso than anyone else in the cast, and that’s quite a feat considering who else Bautista is billed with in this movie. On the other hand, Zoe Saldana’s Gamora, as well as more or less every bad guy and girl in the film, are left to their own devices as to the task of being intimidating or at least living up to the intimidating reputations that the audience is told about but rarely shown evidence of. For example, according to Marvel Comics lore, Gamora is called “the most dangerous woman in the universe.” If it was Gunn and Perlman’s hope to convey that with what they gave Saldana to work with, then they need to revisit their definition of “dangerous.” Tough, she is certainly, but deadly? The talking raccoon in the movie seems more inclined to murder and mayhem than she is. Despite those shortcomings, in the context of what the Marvel movie making machine has churned out so far Guardians of the Galaxy falls squarely amongst the stronger, more enjoyable films. In its finest moments, it’s a fun ride that rarely stumbles in its efforts to entertain, and it should provide lots of fodder for nerd debate regarding its implications for Marvel Cinematic Universe movies yet to come. It may not break any new ground for sci-fi films or set any new standards for comic book movies, but it doesn’t set those genres back at all, either. It’s just solid, popcorn-munching material. Starring Chris Pratt, Zoe Saldana, Dave Bautista, Vin Diesel (voice), Bradley Cooper (voice), Lee Pace, Michael Rooker, Karen Gillan, Djimon Hounsou, John C. Reilly, Glenn Close, and Benicio del Toro . Directed by James Gunn.